Headed to a preschool field trip this morning to a local pumpkin farm. My little guy is so excited, should be fun, sack lunch and all. Also, finally decided that my husband and I are going to be a “Pirate” couple for the Halloween party we have this weekend. We look like Disney Pirates of the Caribbean workers! I don’t think he’s thrilled with the afro wig I got to go with his! I’ll be sure to take pictures! I’m excited to share these devilish gigantic brownies today. These bad boys are perfect for any fall party you might have coming up. I whipped them up yesterday while the boys were at school and I must say, they are INCREDIBLE and oh so easy. 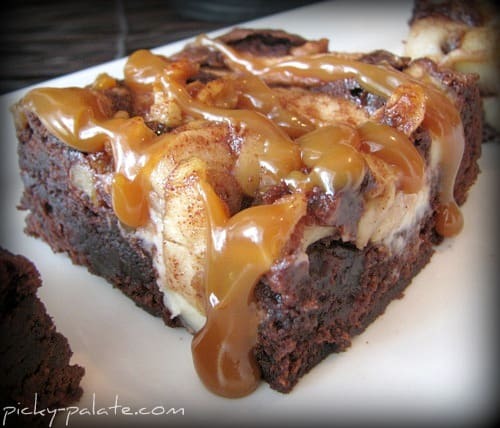 Apples, cream cheese, caramel and brownies…. talk about a fabulous combination. What are you waiting for, get baking!! 1. Preheat oven to 350 degrees F. Prepare brownie mix according to package directions. Pour into a 11×7 inch (makes thicker brownies) baking dish that’s been lined and sprayed with tin foil (easier to remove and cut brownies). Place softened cream cheese and sugar into a mixing bowl, mix until smooth. Place dollops of cheese over brownie batter. Use a butter knife to carefully swirl without dragging against the bottom of dish. 2. Place butter into a large skillet over medium heat to melt. Add apples, brown sugar, cinnamon and chopped walnuts. Cook and stir for 5 minutes. Remove from heat and pour evenly over brownies. Bake for 45-55 minutes or until center of brownies are cooked through. Remove and let cool completely before cutting into squares. Just before serving, drizzle with caramel sauce. YUM, Jenny! Have fun at the Pumpkin Patch! Our class went yesterday and the kids LOVED it. Oh delish!!!! I so love all of the fall recipes!!!!!!! it legal to eat those for breakfast? I’m thinking I want one or two or… seven right now! Wow these are seriously incredible!!!! What a brilliant idea – it’s like combining caramel apples, cheesecake, and brownies! Your pictures are amazing! Interesting brownie combo! I love it though! I just started liking apple pie (I know, I’m behind) and I think this might be a nice way to celebrate! Also- did you pick the winner from the giveaway on the 8th yet? My fingers are still crossed! But I didn’t see a post so I thought I’d check! Fabulous! These look wonderful. Can’t wait to see pics of your halloween constumes! Oh My! You and your desserts. Man, gotta save this recipe to try too! This looks so yummy and it’s only 9am!! Oh Jenny… These look awesome!! I have a kiddo dessert I am trying this weekend & this one will be perfect for the big kiddos! Beautiful photos. Love the caramel oozing off the spoon. Holy crap, that looks amazing. Seriously. Yum! Great combo of flavors. Gooey and delicious! Those brownies are dangerous with me around!!! These must be from heaven! I can’t take my eyes from it. Gorgeous photos! Your pictures have my mouth watering! Wow this looks amazing! 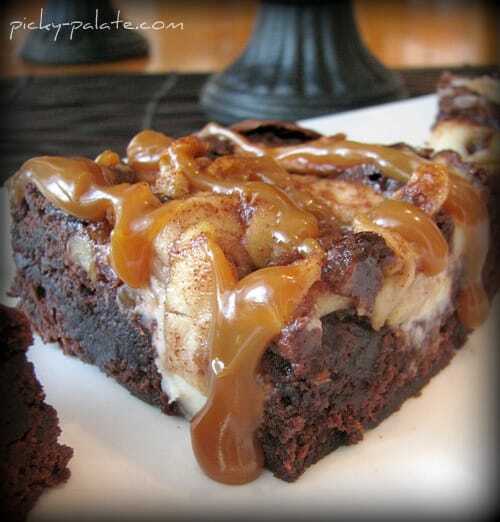 I love how delicious the apples look sitting on top of the brownies…I need one now! Seriously, your photos always make me drool – I can’t wait to make this! I have to try this one too. OMG the carmel looks so good that is mine and my daughters weakness. Thanks again for another wonderful recipe. Oh, Jenny, these are fabulous! Almost like “grown up” caramel apples. Yum! OMG all I can say is YUM. Yikes! 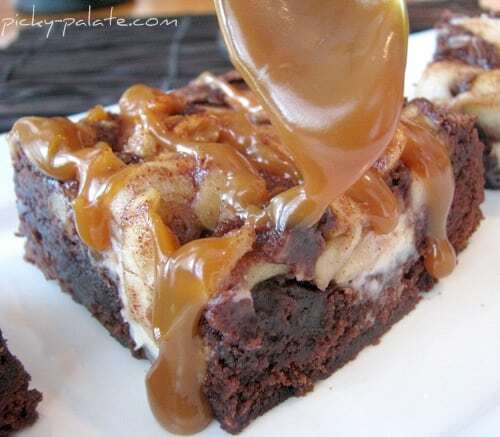 Apples, caramel and brownies all in one bite? Drooling big time here. These look so amazing that I had to try and make them! They are actually in the oven 🙂 The aroma from the apples is delish and they were so simple to make! Thanks for the recipe! Can’t wait to see the final product! These look amazing! I am going to make these for a Halloween party. I am sure they will be a hit! Caramel, chocolate, and apples? Yes, yes, and yes!!! These look amazing!! These look amazing! 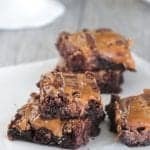 I was looking for a carmel cream cheese brownie recipe, but now this is the one I’m trying for Halloween. Wow. That’s all I have to say! Delicious!! P.S. Thank you for the lovely comment on my blog. I’m glad you’re getting use from my ideas!! :o) God bless! Несмотря на то, что эндоскопические операции в урологии, как правило, проводятся под общим наркозом, нет необходимости в том количестве анестезирующего вещества, как при обычной, травматичной операции. Это позволяет значительно уменьшить нагрузку на сердечно-сосудистую систему и снизить количество постнаркозных осложнений. Также уменьшается лекарственная нагрузка в послеоперационном периоде. Благодаря малой инвазивности нет повышенного риска инфицирования раны, заживление идет быстро, и нет необходимости в массированной антибактериальной терапии, которая назначается всегда после открытых операций. Remarkable things here. I’m very happy to look your article. Thanks a lot and I’m looking forward to contact you. Will you please drop me a e-mail? Superb website you have here but I was curious about if you knew of any forums that cover the same topics discussed here?